November 9, 2011 - In September 2011, the world at large learned that some 250 GE engineers and manufacturing workers were honored by a U.S. president. That president was Ronald Regan and his presidential commendation took place 17 years ago, in August 1984. The reason for the delay was the workers’s top-secret mission, which was only just declassified: they were building key components of Cold War-era spy satellites, the Gambit and the Hexagon. “I’ve been waiting for this to happen,” says retired engineer Fran Smith. The spy satellite programs ran from 1963 to 1986. The Hexagon was one of the largest spy satellites ever built. It was the size of a tractor trailer, 10 feet in diameter and 55 feet in length. GE designed and built recovery vehicles for the satellites, command systems, mission planning software and other systems critical for the mission. The recovery vehicle for example was designed to bring safely to Earth the satellite’s precious cargo: the exposed film. This was still during the dawn of digital communications and the era when images can be beamed from space wirelessly. The engineers were working with the cutting edge technology of the time: transistors, diodes, and capacitors. Smith recalls that his top-notch memory system could store 1000 words holding 40 bits of data. Today, a simple memory stick can hold gigabytes of data. Although the Gambit and the Hexagon programs have been declassified, the photographs the satellites took are still secret. 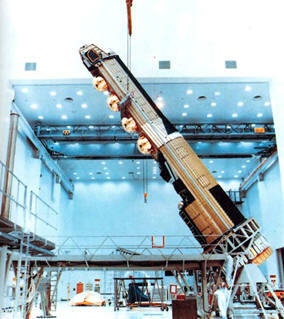 The National Reconnaissance Office stated that the programs gathered “highly detailed imagery of sensitive targets, and became a major source of information for photo analysts during the Cold War.” The NRO also said that the satellites served as “primary means for verifying Soviet compliance” with nuclear arms control agreements.